6 AUGUST 1552: THE DEATH of Sir George Throckmorton of Coughton Court [uncle by marriage and cousin]. George was the eldest son of Sir Robert Throckmorton of Coughton by Catherine, daughter of William Marrow. Sir Robert Throckmorton was a courtier and Councillor to Henry VII. Before his death, in Italy while on pilgrimage to the Holy Land, Sir Robert had seen George launched at court and in local government and in enjoyment of numerous leases and stewardships. This early advancement may have owed something to Throckmorton’s marriage to a daughter of another courtier, Sir Nicholas Vaux, whose stepson Sir Thomas Parr, comptroller of the Household to Henry VIII. George was a loyal subject to the crown, however when it came to Henry’s divorce from Katherine of Aragon he opposed it. He did not approve of Henry marrying Anne Boleyn and was vocal about it. After all, he was close to Sir Thomas More and the Throckmorton was a devout Catholic family [still are to this day]. George’s circle included supporters of Katherine of Aragon which included Lady Maud Parr, his sister-in-law [wife to Sir Thomas Parr, brother of his wife Katherine]. Maud stayed with her mistress until her death in 1531. Later on, George was steward from 1528-40 for Thomas Seymour, [later Baron Seymour of Sudeley]. The marriage of Katherine Parr to King Henry VIII in 1543 proved helpful to his children, but George was still in disfavor at court. George was part of the fall of Thomas Cromwell, but his part in it is obscure. Cromwell had somewhat kept George in disfavor for quite some time. The two clashed on religious ideals and other matters of state. The Throckmortons who had converted to Protestantism were held high at court and helped out their cousin Katherine Parr during her reign as queen and as dowager queen. Several Throckmortons did stick to the “old” religion and later found themselves in trouble during the reign of Elizabeth I [daughter of Henry VIII and Anne Boleyn]. By 1512, George married Katherine, daughter of Sir Nicholas Vaux [later 1st Lord Vaux of Harrowden] and his first wife, Elizabeth FitzHugh. Elizabeth FitzHugh was the paternal grandmother of Queen Katherine Parr; daughter of Lady Alice FitzHugh [born Neville, granddaughter of Lady Joan Beaufort, Countess of Westmorland]. The couple had eight sons including Anthony, Clement, George, John I, Kenelm, Nicholas and Robert and eleven daughters. Tomb of Sir George and his wife Katherine [Vaux] in Coughton Church, Warwickshire, England. 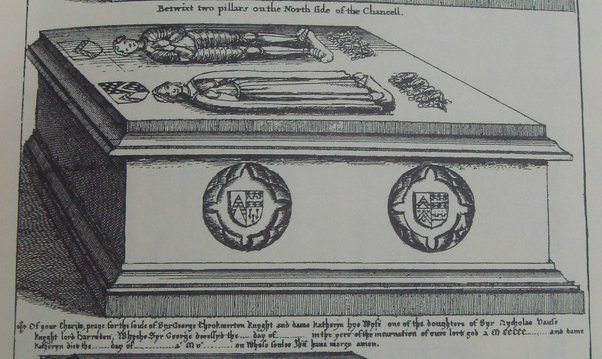 Throckmorton died on 6 August 1552 and was buried in the stately marble tomb which he had prepared for himself in Coughton church. 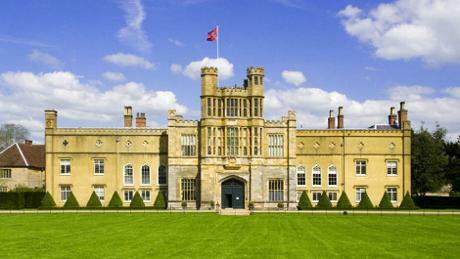 The most impressive monument which he left, however, was the gatehouse of Coughton court. Throckmorton spent most of his life rebuilding the house: in 1535 he wrote to Cromwell that he and his wife had lived in Buckinghamshire for most of the year, ‘for great part of my house here is taken down’. In 1549, when he was planning the windows in the great hall, he asked his son Nicholas to obtain from the heralds the correct trickling of the arms of his ancestors’ wives and his own cousin [and niece by marriage] Queen Katherine Parr. The costly recusancy of Robert Throckmorton and his heirs kept down later rebuilding, so that much of the house still stands largely as he left it. 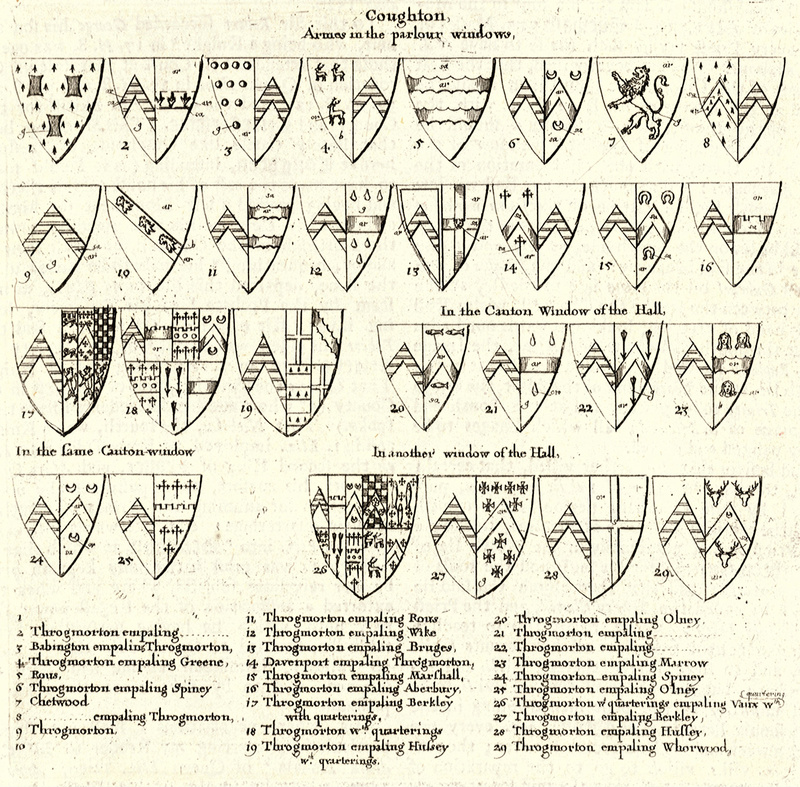 Wenceslas Hollar’s depiction of the heraldry at Coughton Court. The additions were made by Sir George.